Radar (abbreviation for ‘Radio Detection and Ranging’) is an electronic instrument that detects mobile and stationery objects by measuring their speed, direction and altitude. Radars are used for a variety of purposes such as air traffic control, speeding traffic and meteorological measurements. 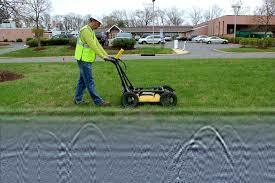 Further, a system that images the sub-surface in a non-destructive and non-intrusive manner is known as the ground penetrating radar. It can measure and map a variety of terrain (such as rocks, soil, water, ice, and man made constructions) and is used in different applications (such as archeological surveys, natural resource exploration, civil engineering, forensic investigations, environmental remediation and three dimensional topography imaging). Ground penetrating radars consist of an emitter of high frequency waves in the microwave UHF or VHF band, and a receiver that detects and amplifies the scattered and reflected waves. Ground penetrating radars can be of various types; differing primarily in data collection techniques used (i.e. ; whether it is in the time or frequency domain). These can therefore be broadly classified on the basis of whether they deploy impulse (called impulse radar; operating in the time domain) or continuous waves (called continuous wave radar; operating in the frequency domain), and variations thereof. Impulse radars acquire data on the reflected energy as a function of time. Since impulse radar has low cost parts and deploys simple impulse waveform generating, it is commercially very powerful. It however has one major disadvantage in that the resolution of its imaging is restricted by the width of the pulse that is used. Continuous wave radars acquire and continuously transmit data on the reflected energy as a function of frequency. Technique involved is to transmit a frequency sweep over a fixed bandwidth, i.e. from a beginning to an end frequency. Reflections waves are mapped as a function of frequency and are a measure of the energy that has been scattered from subsurface objects. Another variation is the stepped frequency radar, which transmits data on reflected energy in stepped linear increments over fixed bandwidths. To eliminate the issue of weaker signals from deeper targets getting masked by the stronger signals, compensation is made for lateral scattering and by taking cognizance of the unambiguous range that can be most accurately measured by the stepped frequency radar. Further variations of the above types of ground penetration radars are ultra wide band radars, synthetic aperture radars, noise source radars and arbitrary waveform radars. Some custom ground penetration radars may also be designed, such as borehole radars.